Why is Adobe Acrobat using only one core for a heavy task, and how can I make it perform faster? Adobe Acrobat is performing Optical Character Recognition on a document with thousands of pages. This is a heavy task which will take hours. Activity Monitor tells me that Acrobat is only using one core. Could it not speed up its performance by using two or three cores? My CPU has four cores. Does it simply want to save some resources for other processes? What is the logic behind this limitation? Also, is there any way I could ask Acrobat to use more cores of the CPU, in order to decrease the time taken for this task? This is an Adobe issue. Namely, Adobe Acrobat Pro is not multithreaded and therefore cannot take advantage of multi-core CPUs. Unfortunately, Adobe has been rather slow in implementing this across most of its software. For example, I refer you to Why is Illustrator throttled to 2% speed when it's in the background? in which Allan provides a great rundown on this (although in relation to Illustrator). In terms of Adobe Acrobat, I refer you to Acrobat and multi core cpu support. Although this is nearly a couple of years old, it is still indicative of the current state of affairs. In summary, there really isn't anything you can do except submit feedback to Adobe about this and hope they implement this soon. Not the answer you're looking for? 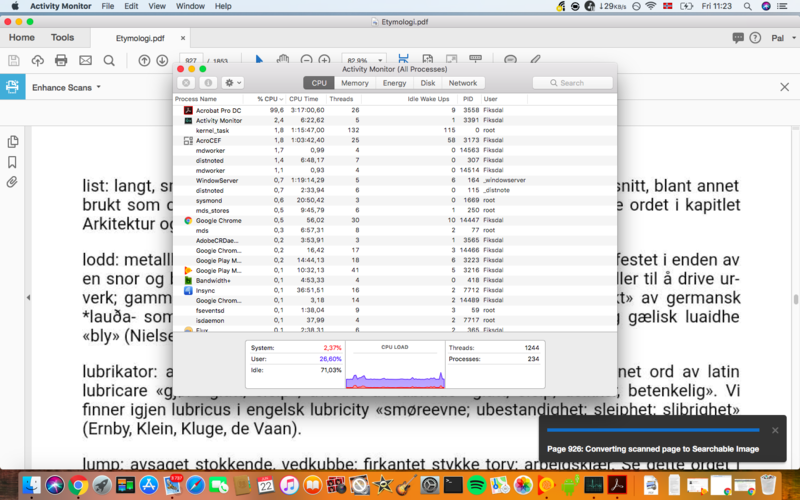 Browse other questions tagged pdf performance cpu activity-monitor ocr . Why is Illustrator throttled to 2% speed when it's in the background? After installing Adobe Acrobat, can I revert to Preview for handling PDF from Firefox? How can I put heavy load on my CPU for a long period of time? How can I simulate light to heavy disk access and light to heavy CPU usage? How can I reduce the heat produced when running resource heavy applications for a long time? How can I make Intel Core i7 Mac perform at i3 or i5 level? Why is My Mac Running So Slowly? How can I sort PDF by date in Adobe Acrobat on iOS?